A bowl of hellebore flowers is a spring tradition in our home. Hellebore or Lenten rose isn’t really a rose, but it does bloom during and after Lent, and sometimes before. The nodding flowers are single, double; white to cream to pink to deep dusky purple. They are dotted, spotted, picoteed, shaded and blushed. If I had to point to a true workhorse in the garden it would be this group of plants. I use the term group, because the complex, hybrid cross is made up of at least five different species, one of them being the original Lenten rose: Helleborus orientalis. 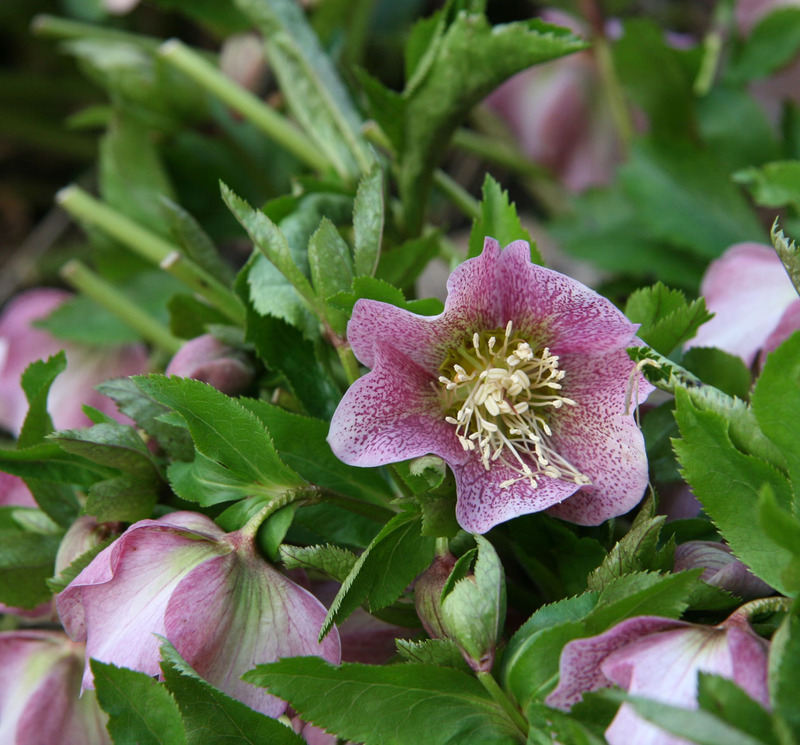 Culturally, hellebores are easy to establish and maintain. They grow well in part sun to shade and will tolerate full sun (6+ hours) if most of that sun is from the east and south. They bloom for 2-3 months. You will notice that some flowers are “in seed” while others are just opening. If you are looking for winter interest, the large, glossy, evergreen leaves offer an alternative to bare soil. A bonus is that hellebores do not allow light to filter down to those pesky winter weeds that need light to germinate. Hellebores take two to three years to establish roots that are drought tolerant. Do not let them dry out the first year and watch them the second and third during dry times and water accordingly. Usually, deer do not eat the leaves, because they are well armed with very sharp serrations, or the flowers which are poisonous. However, if a deer is hungry, all bets are off. If you are a lazy or very busy gardener who doesn’t always get to dividing your perennials, hellebores are happy to grow in the same place for years. I have three-foot-wide plants that have been in the same place for 14 years. When you do divide them, do so carefully, as they are not fond of excessive root disturbance. So what’s the downside of this plant? They do have a tendency to self-seed; a lot. But, the seedlings are easily raked up and left under the plant to compost back into the soil. Or, thinking about this in another way: you have lots to share. 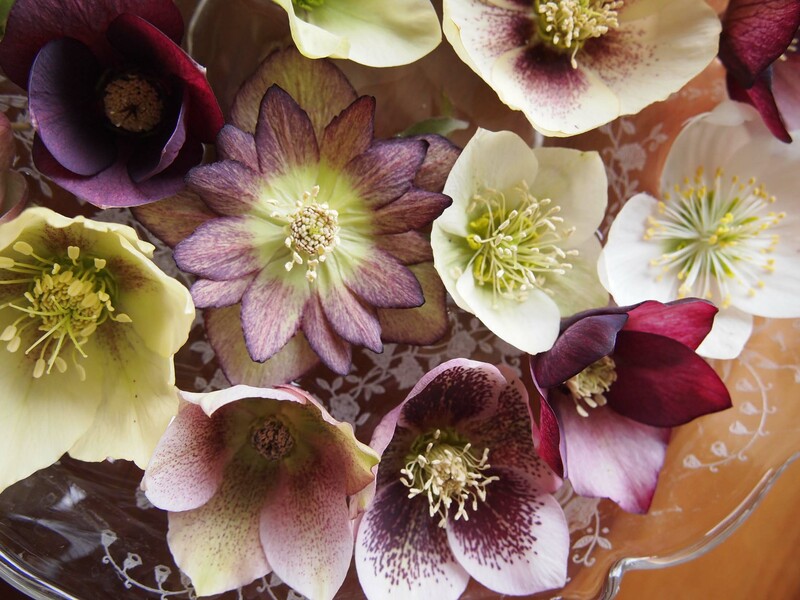 Displaying Helleborus flowers, like you have, in a shallow bowl is smart! It is a great way to show off the variety of colors and even various stages of bloom (even as they go to seed they are pretty! ).